4-Way or All-WAY STOPs are complicated and a must know for a road test - watch the video. Hi there smart drivers. 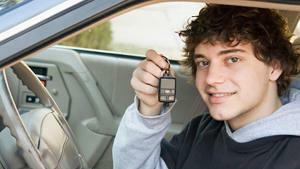 Rick with Smart Drive Test talking to you today about the four-way STOP. 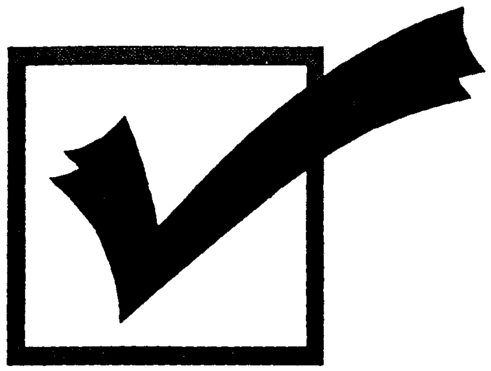 In the manual, it says that the first vehicle to arrive at the intersection has the right-of-way and if you're not sure, the vehicle on the right - give them the right-of-way. Remember, the right-of-way is never taken, it's always given. Today, we're going to give you a little bit more information about the four-way STOP. Particularly when the intersection's busy. We'll be right back with that information. Remember, the right-of-way is never taken, it's always given. Hi there smart driver, welcome back. Rick with Smart Drive Test talking to you today about the four-way STOP. In the manual, it says that the first vehicle to arrive at the intersection has the right-of-way. As well, if you're unsure when you arrive at the intersection, give the right-of-way to the vehicle on the right. Now there's a couple other things you need to know, particularly when four-way STOPs get busy. And where you need to stop for the purposes of a road test. I'll put a video up here for you for the complete stopping positions at STOP signed intersections. Look at that video - know where you need to stop. Most four-way STOPs are going to have stop lines, so it's not going to be confusing about where you stop because these intersections are busy. They have crosswalks--as you can see here in the image--with pedestrians and you're going to have to give the right-of-way to pedestrians. As well, when they're busy they take turns - it's almost as if your lane of traffic goes and then the cross- traffic goes. If two vehicles are proceeding straight, the two vehicles can go through the intersection at the same time. And then the other lane of traffic takes its turn. And two left turning vehicles across from one another can proceed at the same time. As well, straight vehicles have the right-of-way over turning vehicle. 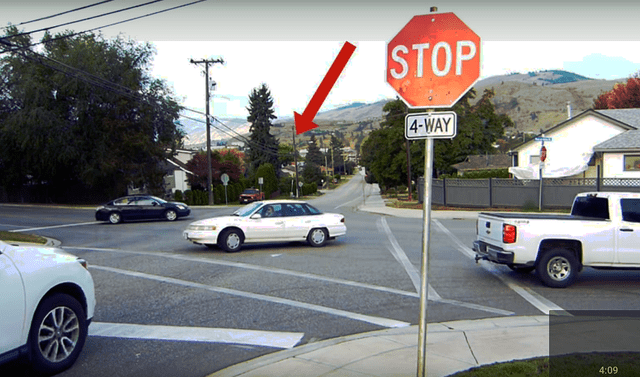 So know that at four-way STOPs that if one vehicle--that you're approaching the intersection you're going straight through and the vehicle is turning that is approaching you--that you have the right-of-way proceeding through the intersection. Now proceed with caution because you may not know whether that other vehicle is going to proceed through the intersection. So straight through vehicles have the right-of-way over turning vehicles. Turning vehicles have to give the right-of-way to vehicles preceding straight through. As well, the cross traffic and the straight through traffic are going to take turns. One lane of traffic is going to go and then the other lane of traffic is going to go. If you're sitting at the intersection and the vehicle across from proceeds through the intersection, you too can go. Make sure you scan the intersection before you go and then proceed through the intersection. Finally at four-way STOPs, you have to give the right-of-way to other road users: pedestrian, scooters, and those types of things. 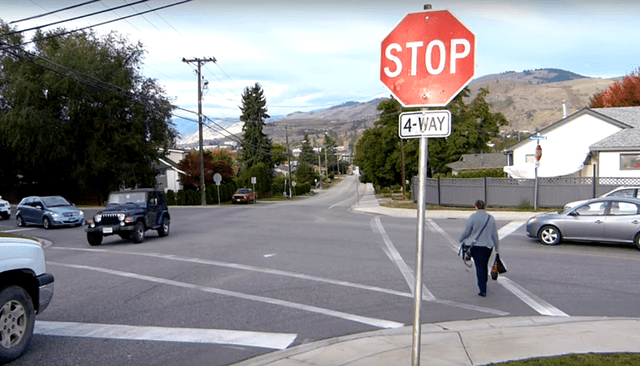 Pedestrians have the right-of-way, so make sure that you give pedestrians in the intersection the right-of-way. If you're on a road test, do not crowd pedestrians as you can see the blue vehicle doing here in the image. It's both discourteous and unsafe and for the purposes of a road test you can't proceed until there's one lane of traffic between you and the pedestrian. And I'll put a card up for you in the upper right-hand corner - check that out! In conclusion, four-way STOPs - all of the rules apply for the three stopping positions at STOP signs. And as I said, check out the card in the upper right-hand corner. That will give you the stopping positions at STOP signed intersections. The first vehicle to arrive at the intersection has the right-of-way; if you're unsure, the vehicle on the right. If the intersection is busy, the two lanes of traffic will take turns - your lane of traffic will go, and then the cross traffic will go. Now the other thing you need to know about intersection is that the straight through traffic has the right-of-way over turning traffic. So if you're proceeding through the intersection and the vehicle across from you is turning, they need to give you the right-of-way, but proceed with caution.